In this work we investigate the approximation problems of the functionsby Fej´er sums of Fourier series in the reflexive weighted Orlicz spaceswith Muckenhoupt weights and of the functions by Fej´er sums of Faberseries in weighted Smirnov-Orlicz classes defined on simply connecteddomains with a Dini-smooth boundary of the complex plane. Orlicz space, weighted Orlicz space, Boyd indices, Muckenhoupt weight, Fej´er sums, weighted Smirnov-Orlicz class, Dini-smooth curve, Faber series. Al’per, S. Ja. Approximation in the Mean of Analytic functions of Class E p , Gousudarst. Izdat. Fiz.-Mat. Lit., Moscow (in Russian), 273–236, 1960. Andersson, J. E. On the degree of polynomial approximation in E p (D), J. Approximation Theory, 19, 61–68, 1977. Andrasko, M. I. On the Approximation in the Mean of Analytic Functions in Regions with Smooth Boundaries , Problems in mathematical physics and function theory, Izdat. Akad. Nauk Ukrain. RSR (in Russian), 1, p.3. Kiev, 1963. Akg¨ un, R. and Israfilov, D. M. Approximation and Moduli of Fractional Orders in SimirnovOrlicz Classes, Glasnik matematicki, 43 (63), 121–136, 2008. Akg¨ un, R. and Israfilov. D. M. Approximation by Interpolating Polynomials in SimirnovOrlicz class, J. Korean Math. Soc. 43, 413–424, 2006. Bennet, C. and Sharpley, R. Interpolation of Operators, Acad. Press, London-Boston, 1988. B¨ ottcher, A. and Karlovich, Yu. I. Carleson Curves, Muckenhoupt Weights, and Toeplitz Operators, Progres in Mathematics 154, Birkhauser Verlag, Basel, Boston, Berlin, 1997. Cavus, A. and Israfilov, D. M. Approximation by Faber- Laurent Rational Functions in the Mean of Functions of Class L p (Γ) with 1 < p < ∞, Approximation Theory Appl. 11 (1), 105–118, 1995. Fej´ er, L. Unter suchungen ¨ uber Fouriersce Reihen, Math. Ann. 58, 51–69, 1903. Goluzin, G. M. Geometric Theory of Functions of a Complex Variable, Traslation of Mathematical Monographs, 26, Providence, RI: AMS, 1968. Gadjieva, E. A. Investigation the Properties of Functions with Quasimnotone Fourier Coefficients in Generalized Nikolskii-Besov Spaces, Authors Summary of Candditates Dissertation, Tbilisi, (in Russian), 1986. Guven, A. and Israfilov, D. M. Polynomial Approximation in Smirnıv – Orlicz classes, Comput. Methods Funct. Theory 2 (2), 509–517, 2002. Guven, A. and Israfilov, D. M. Rational Approximation in Orlicz spaces on Carleson curves, Bull. Belg. Math. Soc. 12, 223–224, 2005. Guven, A. and Israfilov, D. M. Approximation by Means of Fourier Trigonometric Series in Weighted Orlicz spaces , Adv. Stud. Contemp. Math. 19 (2), 283–295, 2009. Ditzian, Z. and Totik, V. Moduli of Smoothness, Springer Ser. Comput. Math. 9 (1987), Springer, New York. Duren, P. L. Theory of Spaces, Academic Pres, 258 p., 1970. Devore, R. A. and Lorentz, G. G. Constructive Approximation, Springer Verlag, 1993. Ibragimov, I. I. and Mamedkhanov, J. I. Constructive Characterization of a Certain Class of Functions, Sov. Math. Dokl. 16, 820–823, 1976. Israfilov, D. M. Approximation Properties of Generalized Faber Series in an Integral Metric, Izv. Akad. Nauk. Az.SSR, Ser.Fiz-Tekh.Math.Nauk (in Russian), 10–14, 1987. Israfilov, D. M. and Guven, A. Approximation by trigonometric polynomials in weighted Orlicz spaces, Studia Mathematica, 174 (2), 147–167, 2006. Israfilov, D. I., Oktay, B. and Akg¨ un, R. Approximation in Smirnov-Orlicz Classes, Glasnik Matematicki, 40-1 (60), 87–102, 2005. Israfilov D. I , Approximation by p-Faber Polynomials in the Weighted Smirnov Class E p (G, ω) and the Bieberbach Polynomials, Constr. Approx. 17 (3), 335–351, 2001. Israfilov, D. I. Approximation by p-Faber Laurent Rational Functions in the Weighted Lebesque Spaces, Czechoslovak Math. J. 54 (3), 751–765, 2004. Israfilov, D. I and Guven, A, Approximation in Weighted Smirnov Classes, East J. Approx. 11 (1), 91–102, 2005. Israfilov, D. I. and Akg¨ un, R. Approximation in Weighted Smirnov-Orlicz Classes, J. Math. Kyoto Univ. 46 (4), 775–770, 2006. Jafarov, S. Z. Approximations of Harmonic Functions Classes with Singularities on Quasiconformal Curves, Taiwanise Journal of Mathematics, 12 (3), 829–840, 2008. Jafarov, S. Z. Approximation by Polynomials and Rational Functions in Smirnov- Orlicz classes, Journal of Computational Analysis and Applications, 13 (5), 953–962, 2011. Jafarov, S. Z. Approximation by Rational Functions in Smirnov-Orlicz Classes, Journal of Mathematical Analysis and Applications, 379, 870–877, 2011. Krasnosel’skii, M. A. and Rutickii, Ya. B. Convex Functions and Orlicz Spaces, Noordhoff, 196 Kokilashvili, V. On Analytic Functions of Smirnov-Orlicz Class, Studia Mathematica, 31, 43–59, 1968. Kokilashvili, V. A. Direct Theorem on Mean Approximation of Analytic Functions by Polynomials, Sov. Math. Dokl. 10, 411–414, 1969. Karlovich, A. Yu. Algebras of Singular Integral Operators with Piecewise Continuous Coefficients on Reflexive Orlicz Spaces, Math. Nachr. 178, 187–222, 1996. Karlovich, A. Yu. Fredholmness of Singular Integral Operators with Piecewise Continuous Coefficients on Weighted Banach Function Spaces, J. Integ. Eq. Appl. 15, 263–320, 2003. Karlovich, A. Yu. Singular Integral Operators with PC Coefficients in Reflexive Rearrangement Invariant Spaces, Integ. Eq. and Oper. Th., 32, 436–481, 1998. Karlovich, A. Yu. Algebras of Singular Integral Operators with PC Coefficients in Reflexive Rearrangement Invariant Spaces with Muckenhoupt Weights, J. Operator Theory, 47, 303–323, 200 Ky, N. X. On Approximation by Trigonometric Polynomials in L p u - Spaces, Studia Sci. Math. Hungar. 28, 183–188, 1993. Ky, N. X. Moduli of Mean Smoothness and Approximation with A p weights, Annales Univ. Sci. Budapest 40, 37–48, 1997. Matuszewska, W. and Orlicz, W. On Certain Properties of ϕ- Functions, Bull Polish Acad. Sci. Math. Astronom. Phys, 7-8, 439–443, 1960. Mamedkhanov, J. I. Approximation in Complex Plane and Singular Operators with a Cauchy Kernel, Dissertation Doct. Phys-math. Nauk. The University of Tblisi (in Russian), 198 Mhaskar, H. N. Introduction to the Theory of Weighted Polynomials Approximation, Series in Approximation and Decompositions 7, World Sci., River Edge, NJ, 1996. Pommerenke, Ch. Boundary Behavior of Conformal Maps, Berlin, Springer- Verlag, 1992. Ramazanov, A.-R. K. On approximation by polynomials and rational functions in Orlicz spaces, Analysis Mathematica, 10, 117–132, 1984. Rao, M. M. and Ren, Z. D. Theory of Orlicz Spaces, Marcel Dekker, New York, 1991. Steckin, S. B. The Approximation of Periodic Functions by Fej´ er sums, (in Russian) Trudy Math Inst. Steklov, 62, 48–60, 1961. Suetin, P. K. Series of Faber Polynomials, Gordon and Breach Science Publishers, 1998. Warschawskii, S. E. ¨ Uber das Randverhalten der Ableitung der Abbildungsfunktionen bei Konformer Abbildung, Math. Z., 35, 321–456, 1932. ISNAD Jafarov, Sadulla Z. . "Approximation by Fej&eacute;r Sums of Fourier Trigonometric Series inWeighted Orlicz Spaces". 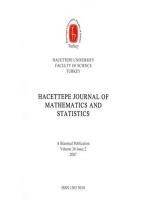 Hacettepe Journal of Mathematics and Statistics 42 / 3 (March 2013): 259-268.